In the land of overdrive pedals, guitar players are swamped with choices. Far too many some would say. While select few overdrives have made it to legendary status, many have faded into obscurity. But Xotic may just have something that you should take notice of in the AC Booster. In our Xotic AC Booster Review, we’ll help you discover if the best guitar overdrive pedal you haven’t played yet is right here in this little yellow box. At first glance there is one seemingly minor little difference between this pedal and many other overdrives. The general trend in overdrives is typically a three-knob layout with Gain, Volume, and Tone controls. And like other Xotic guitar pedals such as the RC Booster or BB Preamp, the AC Booster features Xotic’s Treble and Bass knobs. Those of you already in the know will understand that this is good news. The Bass and Treble controls are finely tuned to provide massive sweeps of EQ for really honing in your sound. This should make for one hell of an overdrive. More on that later. Let’s run down the features and get to the review. 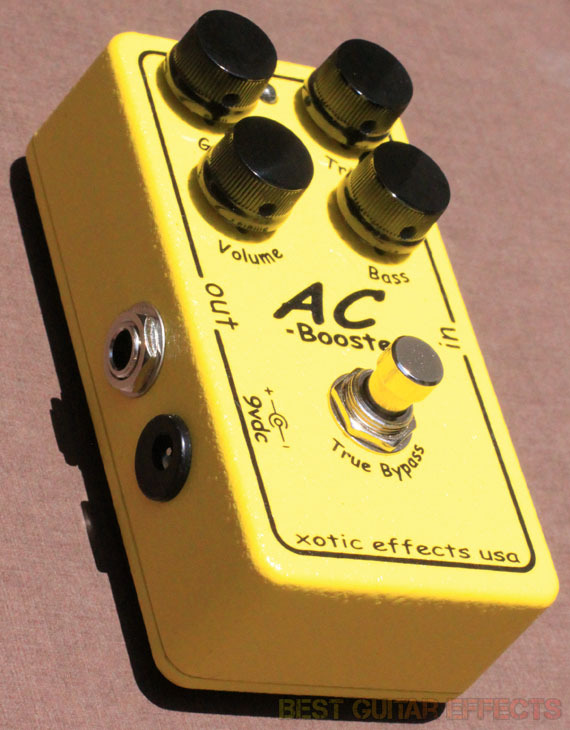 Visit Xotic Effects for more info about the AC Booster. I plugged in my Fender American Standard Stratocaster to start off and went right into the AC Booster and into a clean amp setting. I fired it up with the knobs at 12 o’clock and was greeted with some nice crunch. I pulled the gain nearly all the way down and adjusted the volume until I achieved an even volume with the pedal on and off. From here I noticed that engaging the pedal seems to provide a bit of a cut to the highs and lows, seeming to be more mid-range focused when the Bass and Treble knobs are set at noon. I raised both EQ knobs to around 1 to 2 o’clock and found the setting where I could really hear the transparent character of my guitar coming through. Xotic seem to have a knack for creating very transparent-sounding pedals as I previously discovered with the RC Booster. Now let’s see what the AC Booster can really do. Pushing the Gain up to just 9 o’clock adds some nice bite. This is where the EQ controls really come into play. I was able to roll back the Treble to get just the right amount of attack without the tone sounding harsh. Taking the Gain to noon really lets the grit come in while responding beautifully to your picking dynamics. This thing purrs when you want it to and lets out a roar on command. Pick softly and you’ll really notice the clarity of your tone. Dig in, and this thing rips. I find that the increase of gain is much more subtle when you push the knob past 12 o’clock. But that suits this pedal well if smooth overdrive is what you’re after. And this pedal works well in front of a dirty amp. I brought out the humbucker equipped SG and dialed in a nice full distortion from the amp. The AC Booster takes a distorted amp over the top for thick leads and smooth saturation. If you really want a mid-range boost, cut back the Bass and Treble controls, push up the volume, and you’re there. There’s a lot of versatility to be found in this pedal. The AC Booster is indeed one of those masterfully crafted overdrive pedals that may enhance your guitar playing experience. While there are many overdrives on the market, few pedals offer as much tone-shaping control as the the Xotic AC Booster. If you want to wake up the tubes of your amp, this pedal may be just what you need to make them sing. The AC Booster is a tasteful overdrive that preserves the dynamics of your playing and your guitar’s inherent character. The simple, yet highly effective EQ controls ensure you’ll find the perfect sound to fit in the mix or cut through when you need to. 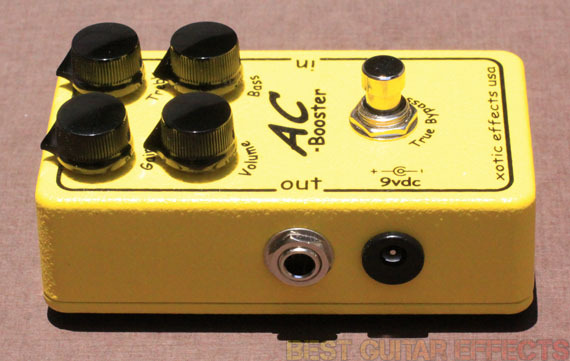 Your search for the best guitar overdrive pedal may be over once you try an Xotic AC Booster. 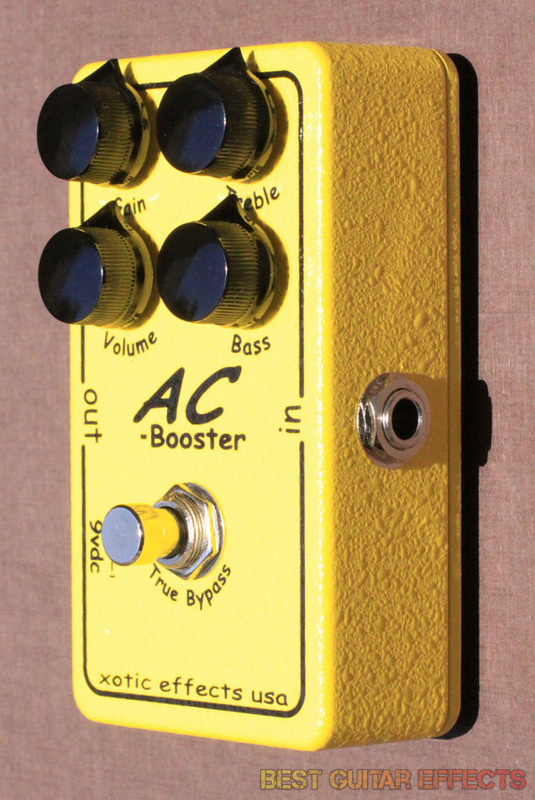 That concludes our Xotic AC Booster review. Thanks for reading. Want to buy the Xotic AC Booster? Greatest booster on the world ! No more overly bright Fulldrive for me. I’m ditching it and going for an AC Booster!